New Issue View FDC Details Nepal Musician Natikaji Shrestha (1925-2003). Welcome to AAS New Issue service for stamps of Bangladesh, Nepal, Qatar, Worldwide. Search new issue by Country or Topic/Theme world wide. Renowned musician late Natikaji Shrestha was born in December 25,1924 in Pulchouk, Lalitpur. Due to the untimely demise of his parents during his early childhood, he was brought up at his grandparents place at Guheshwori, Kathmandu. His grandfather was a priest of famous Guheshwori temple, where Bhajan (religious songs) was played everyday. His childhood was passed in that musical environment which attracts him towards music at the age of 5 or 6 years old. Natikazi was graduated in music (B.Mus.) from Prayag Sangeet, Ilahabad, India. He had worked in Radio Nepal from 2007 B.S. up to 42 years. In his musical life he had did music for more than 2000 songs of different discipline like modern ,folk, religious and national similarly he had compose music for 22 opera music and Nepali movie like Manako Bandha, Sindhur etc. He had also composed different songs and also gave voice to more than 200 songs. His contemporary singer like Narayangopal, Premdhoj, Fatheman, Bachukailash, Mira Rana, Aruna Lama and modern singer like Ramkrisna Dhakal, Yam Baral, Lochan Battarai etc. are able to give voice in his music. He has been awarded with various prestigious honors and awards such as Gorakha Dakshin Bahu first class, Trishakti Patta, Indra Rajya Laxmi pragnya puraskar, Rantna shree padak, Birendra- Aishworya Sewa Padak and many more felicitations awards. He visited number of countries such as India, Russia, Pakistan, Sri-lanka, Korea heading the musical team representing Nepal. I'o Preserve, promote, publish and do analysis of his contribution in Nepali musical field Natikaji Memorial Society has been established in 2062 B.S. Natikaji Shrestha, the senior musician of Nepali music was passed away in November 2, 2003. 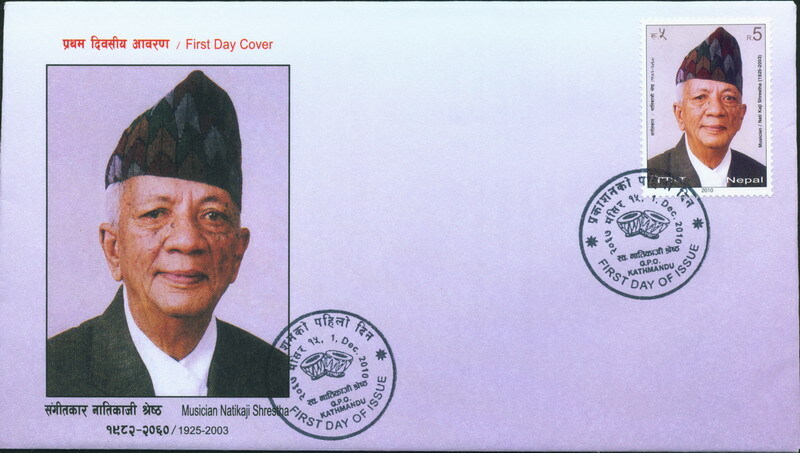 To honor the national contribution through musical field of senior musician and singer late Natikaji shrestha The Postal Services Department of Nepal issue this commemorative postage stamp depicting his portrait.